winter crafts for preschoolers | The Loudest Librarian! Winter storytimes in the San Francisco Bay Area are always a bit confusing because we never get snow. At least not here in Pacifica. A few years ago I drove my son up to La Honda, where there was a patch of snow on the side of the road about the size of a bathmat. I pulled over, and we had what was probably the world’s tiniest snowball fight. So, although most of the kids here have probably seen snow somewhere, their idea of Winter is probably a lot different from the idea portrayed in most picture books. 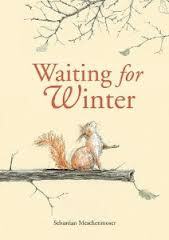 Funny story about a squirrel, a hedgehog, and a bear who are waiting for snow. All they know is that snow is “white, wet, cold, and soft,” and they each set out to find something fitting that description. Hedgehog finds a toothbrush, and imagines bunches of them falling from the sky. Squirrel finds a tin can, and bear finds an old, smelly sock. My daughter loved this story, and it got laughs from the little girl who was the first to show up at storytime (the other families arrived a bit late). I was sad to discover that this book is out of print, and very expensive even to buy used on Amazon. If you live in San Mateo County you can check it out from the Peninsula Library System by clicking on the title above. To search for it from other libraries, try putting your zip code in this search box on WorldCat. One of my favorite picture books from last year. The story is based on a traditional Iroquois tale about a rabbit who makes it snow in the summer by singing and playing a special song on his drum. It’s a longish story, but it works well even for preschoolers because of the repeated chant and song. I shared this with two second grade classes last year, and was pleased to hear them marching through the halls of the school afterwards chanting, “I will make it snow. Azikanapo!” It would work well for themes about the seasons or Native American tribes. All the Froggy books follow the same basic pattern, but the kids love them. They anticipate the repeated cry of “FROGGY!” which is great, because the word is always written in big, bold, colorful letters that you can point to (studies have shown that pointing out words on the page is important for helping kids learn to read later on). 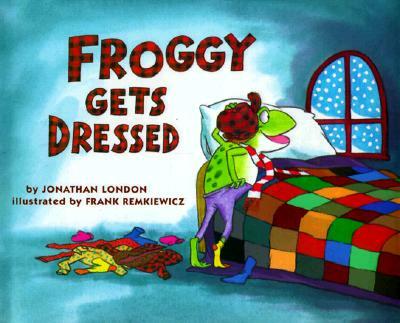 The kids love this book in particular because Froggy forgets his pants, his shirt, and, oh yes, his underwear! Big laughs all around. I hadn’t originally planned to read this one, but it was in my stack, and one of the kids was drawn to the cover. A young bear who wakes up in the middle of the night at his grandparents thinks he sees his grandfather feeding a dragon in the basement. This leads him to a terrible nightmare, where a hungry dragon eats all the milk and cookies in the house. Of course, when he wakes up, he learns the dragon is really his grandfather’s woodstove. 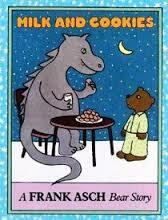 I love all of Asch’s bear stories, and the kids seemed to enjoy this one too. 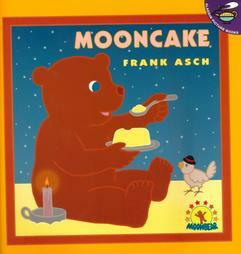 One day, Bear wonders what the moon tastes like, and decides to build a rocket ship to find out. But by the time his rocket is built, it is Winter, and he falls asleep in the middle of the countdown. Waking up in a snowy landscape, he assumes that he has landed on the moon. There are several Bear and Little Bird books, including Happy Birthday, Moon, Moonbear’s Dream, and Bear Shadow, and I love them all, although I find it helps to make sure the kids understand the underlying principle (shadows, echoes, dreams) before I read the story. In this case, I asked the kids if they knew what bears did in the Winter, and we talked very briefly about hibernation. I was surprised that some of the kids remembered me reading it a long time ago, and were excited to hear it again. We sing in mitten weather. 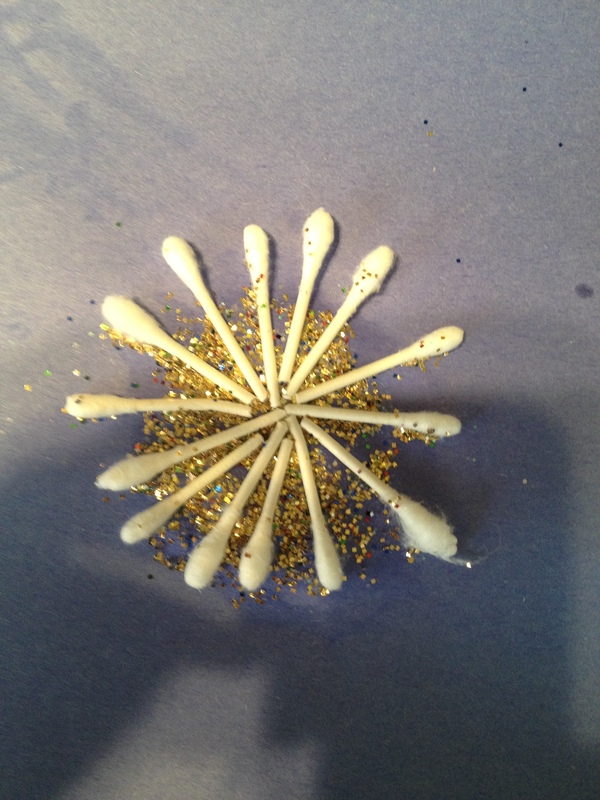 The idea was for the kids to glue the Q-Tips pieces to blue construction paper in snowflake patterns, and then sprinkle them with glitter. A funny thing about kids crafts though: they sometimes evolve into something else entirely. During the instrument time at the end of the storytime, I had scattered paper snowflakes for the kids to pick up and take home. 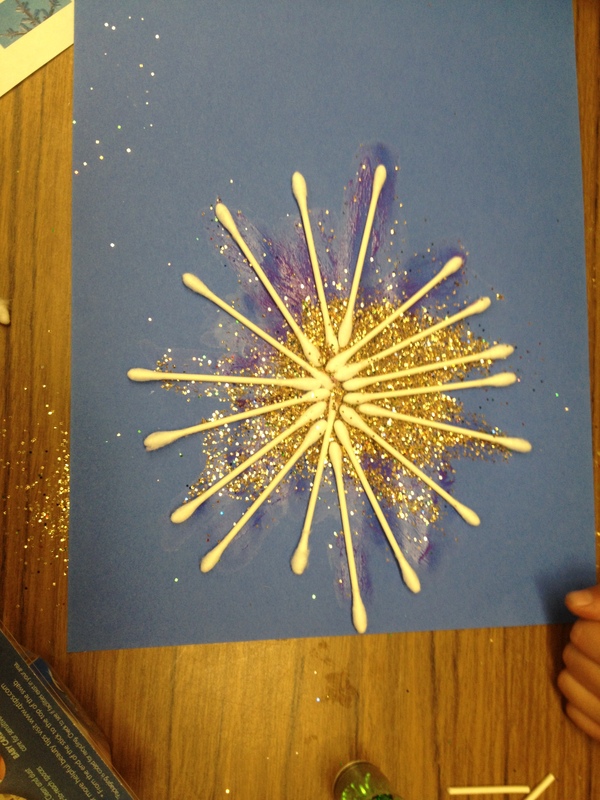 Several of the kids decided to glue the paper snowflakes onto the construction paper and decorate them with glitter paper instead of making Q-Tip ones. It’s always fun to see their creativity at work. Every snowflake was truly unique! Other easy Winter crafts I’ve done in the past are paper snowflakes (I prepare the folded paper ahead of time, so the kids just get to cut pieces out of it with kids’ scissors and open it up to reveal their snowflake. Here’s a page of instructions on how to do the folds from Instructables.com). Mittens are also easy and fun. You have the kids put their fingers together like they would if they wearing a mitten, and trace the shape of their hands on paper to make mittens. Then they can color and decorate them, or even cut them out and tape a piece of yarn between them. Or, for a fun food craft, try these marshmallow snowmen. My daughter loves this one. It’s a fantasy story along the lines of Frosty the Snowman, about a little boy’s adventures with Jack Frost over the course of one fun winter. Jack Frost tells the boy that he must never mention anything warm in front of him, or he will disappear. They have a wonderful time together, until the boy finds a snowdrop flower blooming in the snow, and Jack Frost disappears, whispering, “See you next year.” The white illustrations on blue background are stunning. This classic picture book and winner of the 1963 Caldecott Award is such a simple and colorful celebration of the joys of playing in snow, and coming in out of the cold. Even thinking about it makes me nostalgic for the few snow days I had as a child in Georgia. A squirrel, a bear, and a crow, and a rabbit are panicked by reports of a giant in the woods, but decide to team up and scare it away. The giant turns out to be a snowman, who melts away. I didn’t know this book, but I found it for free on Open Library, and read it to my daughter, who demanded to hear it again as soon as I finished it. The story is very similar to A Stranger in the Woods, which features beautiful photographs of forest animals by Carl R. Sams, but I think I like the text of this older story better. When the first two snowflakes fall, no one believes anything will come of it, but a boy and his dog know that the big snow is coming. 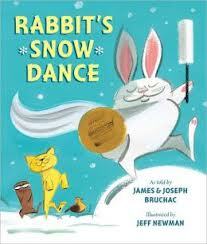 Fun read aloud for any age that captures the hope of a snow day. What are your favorite books about winter?